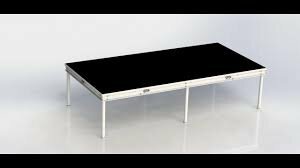 We carry the AS2100 aluminum staging system, designed for versatility and durability. Our professional crew can set up these stage decks in many shapes and sizes up to 24x24 feet. Optional add-ons include stairs and skirting. Stages can be used indoor or outdoor and set up at different heights...the possibilities are endless. Ideal for DJ's, bands, runways, speaking engagements, weddings and more.